When the Civil War broke out photography was barely past being a novelty. No longer the realm of experimenters, photo studios became the closest thing to a mass media product in the 19th century outside of newspapers. Anyone with a few dollars could go to a studio and get a few pictures made of themselves on carte de visites, small cards with the image printed on them. When war came photographers by the thousands came to get their pictures made before going to battle. Matthew Brady and Alexander Gardner were the best of these and they had different philosophies about how to cover the war. At first Brady was determined to photograph a battle as it happened, but the cameras of the time required many seconds of exposure and were large and vulnerable devices. Brady's experiences at First Bull Run, whatever they were, taught him that photography would have to be done differently. Brady sent out teams to several fronts and had them photograph scenes of camp and in the immediate aftermath of battle (being a northerner, this relied on the battlefield remaining in Union hands). Gardner, a former employee of Brady, also went to the battlefields (usually beating Brady and his teams) and looked for the unique and the macabre... and not shrinking from "rearranging" the battlefield on occasion to "better reflect" the nature of war. This was in contrast to Brady's pictures of the site of Lee's surrender at Appomattox and even a photo of Lee himself. Pistor characterizes Brady's approach as "artistic" and Gardner's as "journalistic." 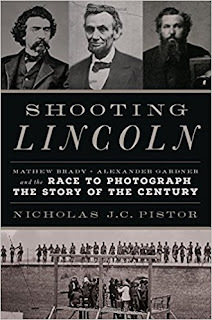 Of course, it was Lincoln's assassination which saw photography really come into its own. Carte de visites of the conspirators were used in wanted posters and distributed to the military who hunted Booth and they were (briefly) used as a measure of loyalty among those interviewed by law enforcement. Gardner used photography to help document the conspirators for all time. Photos were used by artists to create propaganda concemning Booth as well as memorials to the slain president. 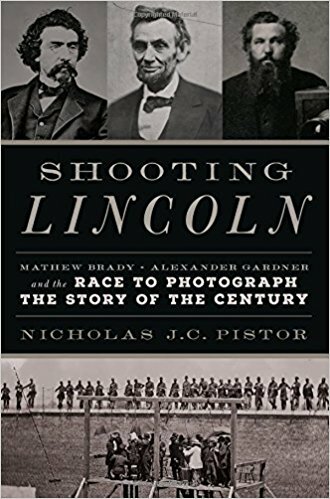 Overall, a very interesting study of the role of photography in the Civil War, although not in depth, and a study of two rival photographers. As would be expected, the book is illustrated by excellent photographs.